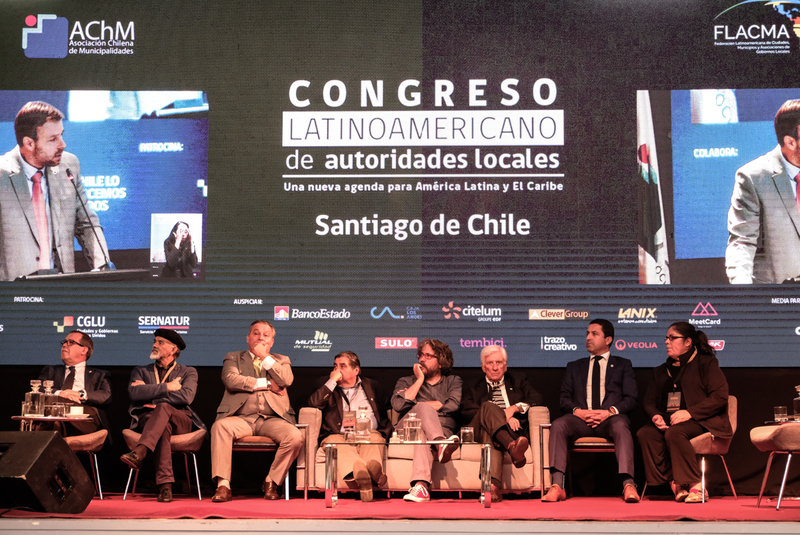 The Latin American Congress of Local Authorities took place from 27 to 29 March in Santiago de Chile. On this occasion, the FLACMA congress was organized by the Latin American Federation of Cities, Municipalities and Associations of Local Governments (FLACMA) and the Chilean Association of Municipalities (AChM). "We want to declare Latin America as a territory of peace" was the spirit evoked by the Mayor of Sucre and FLACMA President, Iván Arciénega, who led the meeting. The congress was attended by more than 900 delegates from 28 countries, including the active participation of more than 20 national associations of local governments, international networks and United Nations agencies. During the inauguration both the president of FLACMA and the outgoing president of the Chilean Association of Municipalities, Felipe Delpin, motivated the multilevel dialogue in order to have a greater presence of local governments in the national and global agendas of development. The strength of the Latin American municipal movement is present in many international spheres thanks to the close collaboration with UCLG (United Cities and Local Governments), as well as other networks. At the invitation of FLACMA and AChM, José Luis Samaniego, director of sustainable development of the Economic Commission for Latin America and the Caribbean (ECLAC) expressed his conviction that the agenda of local governments will be the most transformative in terms of sustainability, but the challenges require better tax collection. The structure of the congress, which had 11 parallel sessions where challenges, projects and possible future agendas and activities were shared, responds to an effort to build from a collective agenda for the region, a renewed FLACMA. UCLG's World Secretariat contributed its point of view on the environment and migration roundtables, topics of special interest in the region at this time. The FLACMA declaration (in Spanish) states the commitments on emerging issues such as climate change, gender equality, migration, transparency and citizen security. Along the same lines and on the same occasion, the AChM elected as its new president the Mayor of Puente Alto, Germán Codina, who shared the 20 priority points of the agenda for the next decade: "My objective is to trace the way to the modernization of municipalities, always with increasing transparency and probity. The main partner for Chile's development must be the municipalities, that's where we want to go". Visit the official website of the Congress. Read the full FLACMA declaration here (in Spanish). Visit the website of the Association of Local Governments of Chile.